Recarta IT Limited have added to their growing list of credentials by becoming a Rated Supplier under the CIPS Sustainability Index. 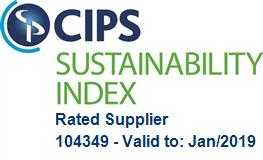 The CSI Rated Supplier Mark enables organisations to publicly demonstrate that they are a ‘Rated Supplier’ on the CIPS Sustainability Index. Endorsed by the Chartered Institute of Purchasing and Supply, the CIPS Sustainability Index is the main supplier sustainability standard. Organisations displaying the Mark have undertaken a rigorous, independent online audit and been rated by the CIPS Sustainability Index. The CIPS Sustainability Index Rating is broken down into the three pillars of sustainability: Social, Economic and Environmental – and is a valuable tool to give buying organisations a clear and consistent assessment of a supplier’s relative performance in these three areas. Recarta are proud to achieve this recognition of their sustainability efforts to view the certificate please click here.